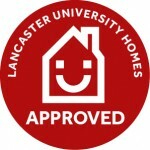 We offer high quality affordable student accommodation in Lancaster City Centre. Great value for money with all inclusive rents starting at £95 per week! We’re a family run business so no middle men – it means we’re cheaper and quicker at getting things done! Now letting for next academic year. Contact Nick to arrange a viewing! Take a look at our available student properties and feel free to email (info@luneproperties.co.uk) or call/text Nick (07966 626 446) for a viewing or further information.